Chemical peels, along with many other skincare products and treatments, are becoming readily available on the high-street. This is no surprise, because they’ve been popular even since the ancient Egyptians, but there’s a right way to achieve a chemical peel. They’re well known for tackling a wide range of skin conditions such as acne, fine lines and wrinkles, and even lessening some acne scarring. Is there a real difference between high-street peels and professional, in-clinic chemical peels? Chemical peels purchased on the high-street are products that fall under the generic umbrella of ‘skincare’, and this is where our first problem lies. They don’t really focus on complex skin concerns or specific needs, like our professional chemical peels do, but rather they just lightly wash the skin. They are a one-size-fits-all kind of skin solution, achieving a very light exfoliation that removes the most superficial dead skin cells. In-clinic chemical peels are tailored to certain strengths and treatment specifications depending on your skin type, condition, and previous skin history. They’re specially tailored to your needs to make sure you receive the results possible. If you’re seeking to tackle a specific skin concern but opt for a generalised and ‘blanket’ product, then you’ll only achieve generalised results. 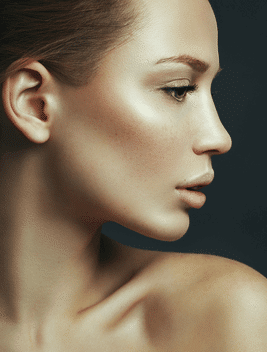 Don’t short-change your skin with a pre-packaged treatment when you could receive expert treatment right here in Knightsbridge. Because high-street chemical peels are available to any member of the public, aesthetically trained or not, they have to be of a certain safe-for-anyone strength. This means that their strength, ironically, is fairly weak. Their acidic concentration and dilution is far lower than our professional chemical peels at Omniya. Because of their lighter composition, they can’t penetrate the skin’s dermis and cause actual skin remodelling. They can’t influence the skin’s health and promote long-term change, they just remove the very surface layer of dead skin cells. Your skin complaints are likely to resurface after a short amount of time, and the complex skin conditions won’t improve. A course of professional peels safely treats complex skin conditions like acne, sun damage, pigmentation, fine lines and wrinkles, and even acne scarring. With a professional chemical peel with Omniya, you also receive our expert advice and aftercare recommendations. These will help you maintain your results, keep your skin healthy post-treatment, and advise you on what more we could help you with. Even though a high-street chemical peel isn’t as strong as its in-clinic superior sister, they’re still a relatively drying skin product. When you don’t visit a professional clinic, you miss out on proper aftercare advice and consultation. For example, we’d always advise you to wear sun protection for a few days after a peel to protect the fresh skin. Letting the skin breathe for a few days is also beneficial, so lessening the topical makeup you apply could help regeneration. You’ll miss out on valuable information when you buy off the high-street. In-clinic chemical peels provide excellent results, but we can also provide advice on how best to prolong them. Chemical peels are a great way to rebalance your skin and bring a fresh glow to your face, but always consider coming to the professionals like Omniya for your treatment! Enquire online or call 020 7584 4777 to book your consultation today.